Long flowering Fuchsias are one of the more popular plants in Australian gardens. Grown for the flowers they are suited to hanging baskets as well as growing in the garden border or in containers. An ever increasing number of varieties are available for sale online, from low growing and trailing types to those that will grow into medium sized shrubs. It is the species that give Fuchsia plants such diversity and these include: arborescens, boliviana, gracilis, magellanica, procumbens and splendens. Fuchsias come in a wide range of colour and most Fuchsias are relatively easy to grow. Fuchsia plants prefer a cool sheltered position, morning sun is ideal. Fuchsias prefer a humus rich moist soil and remember to prune back after flowering to maintain shape. The trailing and smaller growing varieties work well in hanging baskets and pots. Fuchsias come in a huge variety of flower colours and forms are available.Fuchsia are a long flowering garden plant with some cultivars seemingly in perpetual bloom. Fuchsias prefer a position in filtered light or at least protection from the hot afternoon sun. A humus rich moist but well drained soil is best and protection from frosts is important. Fuchsias do well in hanging baskets. 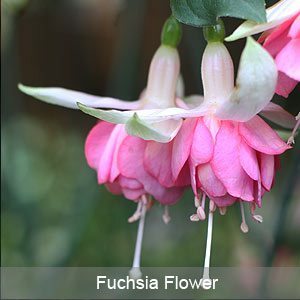 Like many plants autumn is a great time to plant fuchsias. The soil is still warm and some new root growth before winter will give new plants a boost. Prepare for planting by digging a hole deeper and wider than the pot, dig in some well rotted compost or cow manure and after planting the new fuchsia backfill the hole and water in well. Fuschsia are often grown in hanging baskets. The baskets are lined with coco fibre. Wire baskets provide good drainage and are often used for planting fuchsias. Fuchsias also do well when planted in pots or containers. Remember that fuchsias like to be moist but not wet, having said that we have fuchsias growing in dappled shade that we never water. Monitor the soil if its dry water, do not over water. Fuchsias in hanging baskets and containers will require regular watering. Fuchsias are not gross feeders, apply specialist fuchsia fertiliser once a year, or try an application of dynamic lifter in spring once new growth has commenced. Slow release fertilisers are best for hanging baskets. Tip prune as required to maintain shape. Most fuchsias respond well to pruning. Fuchsias are fairly pest and disease free once established. If you follow basic procedures such as making sure mulch is kept away from the stem of the plant to help prevent collar rot and providing a humus rich well drained but moist soil you should have few problems. Caterpillars, thrip and a few other insects can be problem, however these are easy controlled with sprays such as pyrethrum based pest controls. Fuchsias do like to have some protections from hot drying winds.